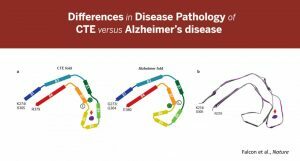 The distinction between chronic traumatic encephalopathy (CTE) and other tauopathies like Alzheimer’s Disease (AD) has become clearer with new research focused on the molecular pathology of the tau filaments. By analyzing the structures of tau filaments from the brains of three individuals with CTE at resolutions down to 2.3 A using cryo-electron microscopy, the collaborative team from the Medical Research Council (MRC) Laboratory of Molecular Biology (LMB) in Cambridge, England, Kansas University, and Indiana University found that the tau structures in the CTE patients were different from what has been seen before in AD patients, giving CTE its own, distinct, molecular pathology. The paper, “Novel tau filament fold in chronic traumatic encephalopathy encloses hydrophobic molecules” was published in Nature on March 20. “This is a big deal,” noted Lee Goldstein, MD, PhD, associate professor of psychiatry at Boston University School of Medicine and a leader in the CTE field who was not involved in this study. 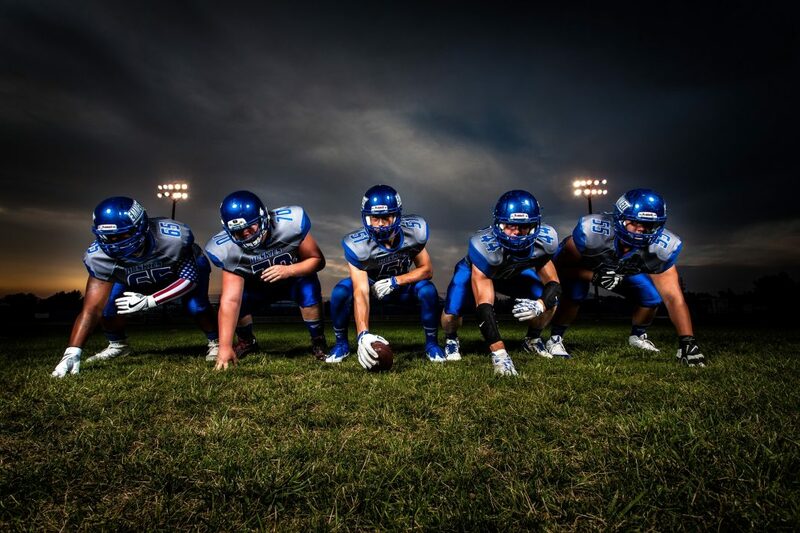 Both CTE and AD involve neurodegeneration and dementia, are progressive and age-related, affect the brain, and involve tau protein. “But, the molecular pathology of the two diseases is different. This fits with a lot of what we have long suspected. But, now we have hard, structural data to support that,” Goldstein added. Just like AD, CTE is a tauopathy in which all six isoforms of tau aggregate. For this reason, some people had expected the tau filaments from AD and CTE to be the same. However, the researchers’ previous observations suggested that different tau structures might underlie different tauopathies. To test this, the research team led by Sjors Scheres, PhD, and Michel Goedert, MD, PhD, extracted tau filaments from the brain of a former professional American football player and two former professional boxers. Using Cryo-EM, they determined that the structures of the tau protein assemblies were identical in the three individuals but different than what had been seen before in other tauopathies. “There were two exciting observations,” noted Scheres. “First, the three CTE cases all had the same tau filament structures, but these structures were different from the structure we had seen in (by now four different) AD patients.” The same amino acids of the protein form the ordered core of the tau filaments in AD and in CTE, but whereas AD filaments are C-shaped, the CTE filaments adopt a more open shape, noted Scheres. In addition, Scheres added, “the CTE tau filaments form a greasy channel, which was found to be filled with other molecules. We do not yet know what these molecules are, but the channel they are in is too small for proteins.” This is the first time anyone has observed disease-related amyloid filaments that incorporate molecules that are not proteins. The greasy character of the channel suggests they could be (derivatives of) molecules like fatty acids or cholesterol. It is not clear why only a small subset of people who have been exposed to repetitive head trauma appear to develop CTE. It is also unknown how head trauma leads to filament formation of tau. One hypothesis is that the availability of these, yet unidentified, molecules, for example, their abundance in blood or brain, plays a role. The brain pathology has been known to be different at the level of the microscope for some time. However, Goldstein noted that the ability to look at the structural pathology at the Angstrom level is a welcome fallout from the emergence of cryo-EM as a major tool for molecular pathology. He added that the big takeaway from this is that “CTE is a bona fide neurodegenerative disorder” and that this is “tremendously important” because there are many people who think that CTE is a variant of AD. But, what this paper is saying is that they are fundamentally different diseases.” The overlap in neurodegenerative diseases is a major obstacle in the field. But, he hopes that research will now start to identify specific ligands that will differentiate CTE and other tauopathies.